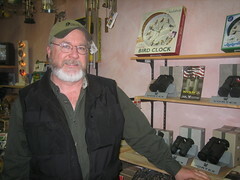 I recently had a chance to stop by The Wild Bird in Poulsbo, WA and say hi to Scott Pomtier, the owner. 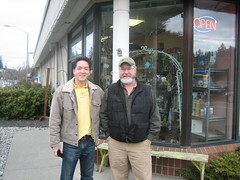 Scott’s been a MerchantCircle member since September 2006 and one of our Top Merchants. In the past, I’ve spoken with him by phone and email, so it was nice to finally put a face to the words and voice. Scott was telling me how he recently wrote a blog post on his MerchantCircle blog about the new restaurant that was opening up next to his store – Taprock Northwest Grill. Later that day, his blog post was already coming up when people searched for the restaurant on Google. He even received a bad review on his listing from someone thinking his was Taprock! (He can delete that review if he wants). The fact of the matter is that the content he’s been creating on his page (blogs, coupons, pictures) helps his MerchantCircle listing show up on search engines and has boosted the page views on his listing from a few dozen, to over 1,000 page views each month. The content he’s creating shows up on search engines as well, even writing about Taprock early, has put that blog on searches that are returned on Taprock! Statistically, a claimed MerchantCircle listing with no created content gets 12 page views a month. A listing with at least one written blog, one created coupon, one uploaded picture, one written newsletter and one review gets just over 200 page views a month. Those with all created content AND are a member of our lowest-priced ad package (at $29/month) get an average of 588 page views a month! Scott is doing everything right, when it comes to utilizing his MerchantCircle listing. It’s one thing to claim your listing, upload a picture and write a blog – all that helps – but it’s very important to continue to do this. It’s unique content, which the search engines love!